For a full list of events check out the Official Ouray Ice Festival Site! Arguably the best way to celebrate a successful day in the park – we suggest checking out our local brewery for a cold one. Ouray Brewery is a huge supporter of the Ouray Ice Festival by donating over 30 kegs to ensure a good time and they have great food and atmosphere – be sure to swing by! Ouray Ice Festival Kick-off Party sponsored by the American Alpine Club and Rab, beer from Upslope Brewing Company, food, prizes and live music by One Roof Blues. A special showing of The North Face film “Always Above Us” with special guest Conrad Anker. $10 gets you in the door. Let’s kick this party off right! Plus, beat the rush and pick up your gear demo card. 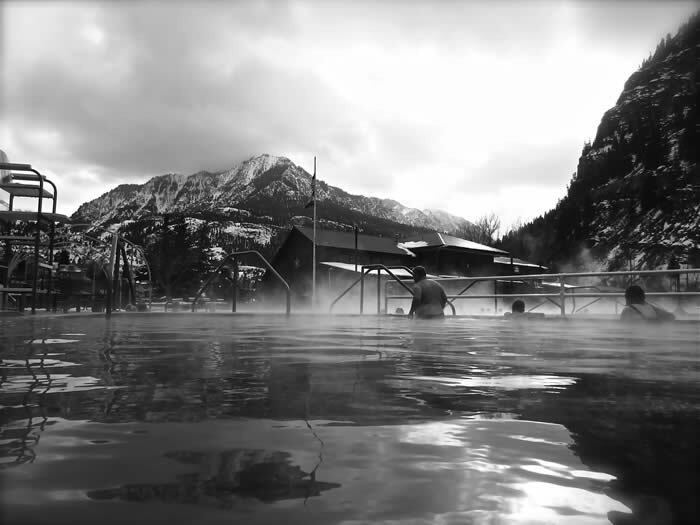 After visiting the Brewery and grabbing some hot food – nothing beats a soak in the Ouray Hot Springs Pools. Ouray’s public pool contains close to a million gallons of crystal clear natural hot springs water, free from the strong smell of sulfur typical of many hot springs. In addition to several soaking sections at a variety of temperatures ranging from 88 to 106 degrees – the final touch to the Ouray Experience! Do you have a date for The Prom? Bust out that old suit or dress for a night of fun as Petzl brings back their Party on Saturday night Petzl Party at the Ouray Community Center! Giveaways, booze, dance-parties and much more you won’t want to miss! A no brainer! Make sure you visit each booth as sponsors will be giving away small to big prizes – anything from climbing gear to small ‘swag’ essentials such as coozies and chapstick! Be there early on Friday to check each of them out before attending your clinic! Be sure to to stop by all of their booths as we over 40 attending sponsors! The Ouray Ice Park title sponsors will have some great giveaways and demos so stop by to thank them for making the 20th Annual Ouray Ice Festival happen! Sash DiGulian is well known in the “Rock” Climbing world for some of the establishing First (Female) Ascents everywhere she goes. She’s currently the World Ranking leader, has climbed dozens of 5.14s and is the first and only North American woman, and the youngest woman in the world, to climb the difficulty grade of 5.14d (9a); the hardest climb achieved by a Female Worldwide. She is also the first North American Woman to onsight 5.14a (8b+). Now she wants to bring her skills to the ice as she competes for the first time in the Ouray Ice Festival as well as holds her first clinic. If you are considering Ice Climbing, this is the clinic for you! The only journey is the journey within” (-Rainer Maria Rilke) – words that Olivia lives by. Olivia began her climbing journey when she was attending University in Brisbane, Australia. What started out as an attempt to meet new, cool people turned into “pseudo” career (as she puts it) because she loves climbing and yoga, equally. Stretch out, relax, learn balance and mental focus. Exercises to help you improve your overall strength and conditioning for climbing.